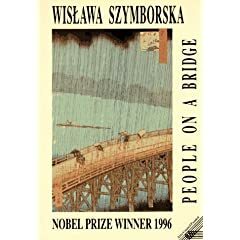 Szymborska’s writing style has a natural, almost conversational tone and flow to it that straighten out obscure notions/meditations. According the poet herself, she writes in terms of stories and essay-poems, which explains the natural flow. This flow is not without thorough thought and disciplined execution, as seen in her precise and deliberate word choice (again, I put my faith in the translator) and organization of thoughts. Even poems as deceptively simple as “Miracle mart” can astound with their simplicity based solely on poetic observation and arrangement/presentation of ideas. the happening of many common miracles. able to cover a large heavy moon. though the waters are shallow. a scattering of white doves. and will set at 20.01.
yet it has more than four. The above is a great example of a complex idea being presented through very plain language. What makes the poem so affective is the thought upon which the plain words beg the reader to ponder. Seemingly throw-away lines like “Any old miracle:/cows are cows,” while pretending to be platitudes, are really clues for meditation. “Miracle mart” is comprised of such hints, and their juxtaposition with each other as well as the order in which they are presented are equally important – not just in understanding the importance of one stanza to the next, but as in understanding the thought process as a whole…to understand the answer that is the poem as well as the question from whence the poem was born. Where “Miracle mart” confronts readers with riddles, “Instant Living” narrates a more fluent string of metaphors. I am ignorant of the role I perform. All I know is it’s mine, can’t be exchanged. I must guess promptly on stage. I find the imposed speed of action hard to bear. I improvise thought though I loathe improvising. At each step I trip over my ignorance. My way of life smacks of the provincial. The stage-fright that is my excuse only humiliates me more. Mitigating circumstances strike me as cruel. this is the sorry outcome of such haste. But now Friday’s already approaching with a script I don’t know. since they didn’t even let me clear my throat in the wings). set in a makeshift office. No. I stand among the stage-sets and see they’re solid. I am struck by the precision of all the props. The revolving stage’s been turning for quite some time. Even the furthest nebulae are switched on. Oh, I have no doubt this is the opening night. will turn for ever into what I’ve done. What starts out as an exercise in extending Shakespeare’s “All the world’s a stage” metaphor flawlessly and seamlessly turns existentialist. It manages this by introducing reader to character and the character’s setting/situation, and then letting the character speak. Nothing else is needed, as it flows like a story but without all the gratuitous blather that is prose. Although this book is currently out of print, used copies can be bought from the link above or possibly at your local used book store. Also, select poems from this volume appear in “Poems New and Collected” (via Amazon.com).